Redoing my Top 21 list over the past week might have been thee hardest list to evaluate. You would think that the list would not change much in just a two month span. Well, a lot of things happened since the end of March. 1. Jose Albertos’ release point deteriorated. Once he gets things figured out, he will be back quickly and impressively. It’s just a matter of time. 2. Duane Underwood looked studly at times and not so much at other times. He needs to find some sense of consistency from start to start. 3. Thomas Hatch has been very consistent every outing. It should not be long before he finds his way to Iowa. Problem is, there is no real spot yet. 4. Nelson Velazquez debuted at South Bend this year and struggled. He is striking out at a high rate and has yet to show much power beyond BP. 5. Dillon Maples struggled at Iowa in April and early May after not making the big league club. He now seems to be much better the past three weeks. He’s allowed just 1 ER since the middle of May and only 3 BBs in his last 7 innings. He’s close. 6. David Bote went to Chicago and did very well in a utility role. He has supplanted himself as the go-to-guy position player now. 7. Wladimir Galindo struggled, was injured, struggled some more, and then caught fire. 8. Aramis Ademan looks overmatched most nights at Myrtle Beach. The Pelicans have started moving him up and down the batting order to try something different. Then again, he’s just 19 and at high A. 9. Last year’s pitching class is killing it. From Lange to Thompson to Lacy to Uelmen to Abbott, the Cubs caught a deep class. 10. No hitter was really dominant in the first two months of 2018. 11. Two months of unexpected performances from Matt Swarmer and Jhonny Pereda might constitute breakout seasons, but does not mean they should be on a prospect list? They are very close, however. 12. Brady Clark is living up to my hype of him from the past two seasons. 13. Chesny Young looks like Chesny Young of 2016. You know, the guy who falls out of bed and laces a single right Chesny Young. I like 2016 Chesny a lot. 14. If Connor Myers can hit a little, his profile totally changes as he is a plus-plus defender and defender. Being able to hit 260-270 could carry him to the majors with his other skills being so predominant. 15. Miguel Amaya is developing into a power hitter quickly. Every at bat is becoming must see MiLB.TV. 17. The Cubs just selected five guys in the top 100 picks of the draft. However, it is a tenth round pick I look forward to in the batter’s box the most in Luke Reynolds. 18. Jared Young has been blistering the ball lately. He started off strong, got hurt, and it took a couple weeks for him to heat back up? 19. Jason Vosler was not good for six weeks and now looks to be ready to move on actaually on pace to hit 25+ HRs this year. 20. DJ Wilson has vanished on the DL. 21. And Eugene and Mesa begin in a week. There we will get a better look at some former DSL guys, Jeremiah Estrada, and s=most of this year’s draft class. After some discussion with some of my friends on these 21 topics and more, online and in the real world, I decided just a few changes would be in order. However, some of those changes are pretty powerful..
Top 21 List as of June 8, 2018. 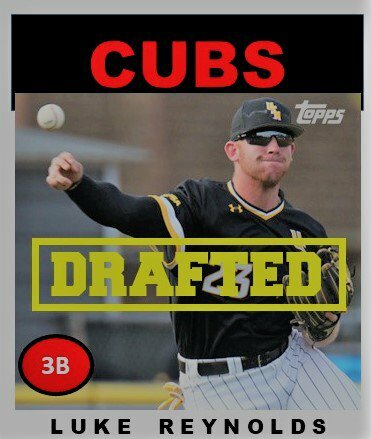 ‹ PreviousDay 3 Draft Q and A – Did the Cubs Change Their System Much Today?